Comm. is a monthly publication targeted at management-level executives within all types of organisations with an interest in or involvement in the telecom sector in Middle East and Africa. Such organisations include regulatory authorities and service operators, as well as technology, equipment, software and handset suppliers, finance institutions, consultants, and researchers. Hard copies of Comm. are free-to-post in the UAE. Subscribers outside the UAE receive a PDF at no charge. Should they elect to also receive a hard copy of the issue, a post and packaging charge amounting to US$50 for the receipt of all nine issues a year is payable through PayPal online. 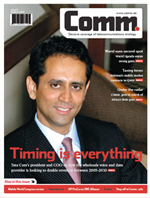 An annual subscription to Comm. (nine issues) is free-of-charge in the UAE only.